Happy fall! It is the beginning of the most wonderful time of the year, even if the weather doesn't actually change in Florida until November (if we're lucky). I'm just glad to know we're moving away from summer and the 90 degree weather, and closer to the beautiful weather that makes summer in Florida actually worthwhile. The coming of fall also means being that much closer to the big trip my family has been planning for the better part of a year. We've taken small weekend trips to Sanibel, but I haven't had an entire week of work off since last summer. When I say that I need this vacation to keep my sanity going for the remainder of 2017, I am in no way exaggerating. So stay tuned for beautiful pictures of leaves changing from the UK and Iceland! 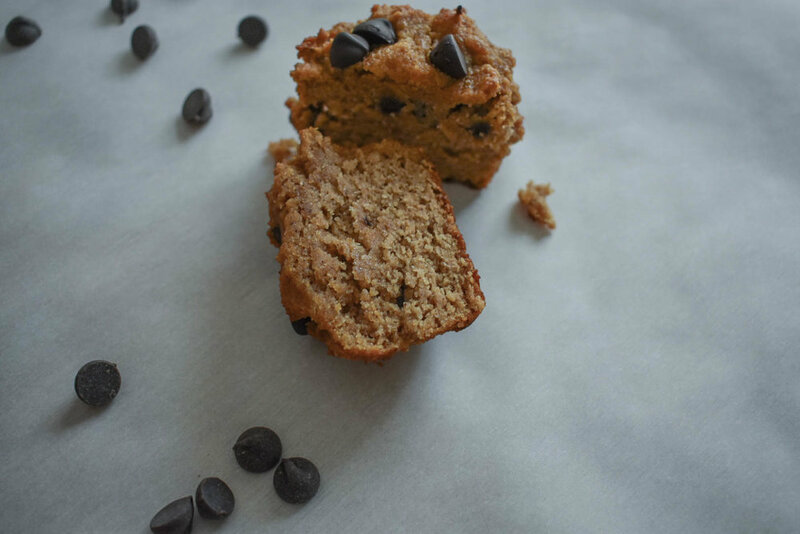 But now on to the real reason you're here: these paleo pumpkin chocolate chip muffins. I couldn't possibly introduce the new season without a recipe that just screams FALL. I'm not going to lie to you though. I tested out this recipe in August because I just couldn't wait any longer. I'm not that girl that races to Starbucks for a pumpkin spice latte as soon as they're out (I've actually only had one PSL and it was gross, plus we don't drink Starbucks). However, I AM that girl that loves all pumpkin flavored baked goods (in case you couldn't tell). Fall flavors are just so comforting to me, and I definitely prefer them to sweeter flavors more common in summer baking. These muffins might be my new favorite baked good of the season. Something about paleo baking makes baked goods even that much better. They're easy to pack up for breakfast and completely guilt free. They're also the perfect amount of pumpkin flavor and spice and have probably already been baked by me 17 times since first recipe testing. Preheat the oven to 350 degrees and line a muffin tin liner. In a medium bowl, combine the flours, baking soda, salt, and pumpkin pie spice. In a large bowl, combine the eggs, coconut oil, honey, vanilla, and pumpkin puree. Fill the muffin tins and bake for 25 minutes.